In a world's first, Australia announced an import ban on lion trophies, which took effect in March this year. The announcement came in response to growing public outrage on the practice of breeding of lions for the sole purpose of killing them. But how can killing a threatened species for fun be legal in the first place? The answer to this question lies with South Africa's fundamental model of conservation. South African wildlife are property. They are private property or state property, and highly valuable property. They can be bought, sold and auctioned. And when animals are property, we can do whatever we darn please with them. Tourism is big business in South Africa, and tourists come for the wildlife. Vast regions that had historically been "cleared" of wildlife, to make way for cattle and sheep, are being "restocked" with wild ungulates and other African fauna, that are now far more valuable. Sheep farms have transitioned into "game farms" and "game reserves" that offer tourists hunting safaris in five star accommodation facilities. Killing wild animals is big business. Hunting comes in four main formats: meat, trophy, green and canned. Meat hunting provide tourists an opportunity to connect with their "Palaeolithic roots," by killing, butchering and consuming wild game meat. Unlike hunter-gatherers however, the game are fenced in. Shops in Johannesburg's O.R. Tambo International Airport offer "kudu biltong," and other traditionally prepared meat from these venues. Trophy hunting is similar, but focuses on the collection of body parts, mainly hide, head and horn. Wild animals are often bred for aberrant colors and other traits to increase their trophy value. These specially bred trophy animals, are worth far more than domestic livestock, and like traditional farmers, the owners of these wild game have no patience for predators. Game farmers regularly poison, trap and shoot leopards, jackals and caracal. So called "green hunting" involves shooting animals with tranquilizer darts instead of bullets. If all goes well, the "hunter" gets to pose with the sedated animal who will later recover. It is promoted as "the thrill without the kill," and is ostensibly tied with research and monitoring activities for conservation work. However, several agencies have argued against green hunting on animal welfare grounds, and the tranquilizer drugs have found their way into the hands of rhino poachers. Canned hunting focuses on large predators, such as lions, that are intensively bred in captivity for the lucrative industry. Lion cubs are removed from their mothers at birth and used as petting animals for tourists. Many unsuspecting tourists are duped into believing that the lion cubs they are kissing are part of an ethical conservation program. But once these human-raised lions grow up, they are taken to a small enclosure and shot. Canned hunting is not only about lions. People looking for the thrill of slaughtering a large predator also have the option of choosing from non-African wildlife, including grey wolves and tigers. Wolves were imported into South Africa by the government in the 80s to breed "the perfect army dog." The wolves eventually found themselves in private homes and businesses, including in canned hunting operations. 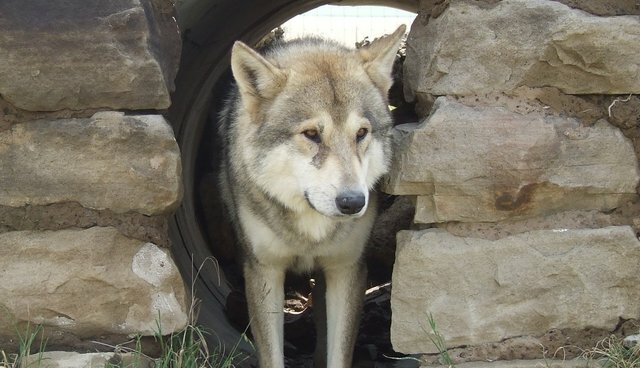 HuskyRomi, a sanctuary outside of Johannesburg, has provided a refuge for over a hundred wolves. When Silver, the wolf pictured, was discovered at a canned hunting business, four friends pooled their funds to save his life and brought him to the sanctuary. Another wolf named Sioux, was saved from a taxidermist. Larry Paul, sanctuary founder, recently turned down an offer of R150,000 (about $13,000) to buy a pair of his wolves for a canned hunting operation. "That's a lot of money for the sanctuary," he says, "but how would I live with myself?" The value of wildlife for the tourism industry has led to a substantial resurgence of many wildlife populations, but also of fences that cut up the country into a multitude of wilderness blocks. While some game reserves have removed internal fences to allow wildlife more space to move between landholdings, many wild animals cannot move freely in South Africa, causing problems of inbreeding and crowding. In response, landowners buy and sell wildlife - sometimes in public auction - shipping animals around the network of private and state-owned game reserves. The game industry however does not mimic the selection forces of the wild. One private game reserve owner explains to me the fundamentals of conservation, South Africa style. On his property he had a male rhino that he considered "no longer useful," because the rhino was getting old, had already sired offspring, and he "didn't need more of his bloodline." So he offered tourists the opportunity to shoot the rhino and used the $50,000 trophy payment to "buy new stock and help the conservation of the species." South Africa National Parks (SANParks) also partake in the lucrative wildlife trade. In a media release from late last year, SANParks disclosed that between 1997 and 2013 they caught and sold 1,450 white rhinos from Kruger National Park to help "offset the effects of poaching ... while expanding rhino range and improving the overall population size." "The money raised from the sale will be ploughed back into conservation," they said. It is not a simple matter to trap and transport a large wild animal, and many animals get hurt and killed in the process. In 2010 a team from Kruger National Parks veterinary services were testing a new chemical substance for drugging hippos. Previous compounds caused the death of a quarter of hippos, but this new drug was proving successful. However, a malfunction in the dart mechanism resulted in incomplete delivery, and the partially drugged hippo was shot dead when he charged at the researchers. But why would it be necessary to tranquilize hippos in the first place? Is it because they too are valuable game animals for the hunting industry? As one tour operator proudly announces in their advertisement: in South Africa "we can hunt basically any animal Africa has to offer." Some Australians would like to import, not only the body parts of wild animals killed in South Africa, but also the values that inform this practice. Several calls have been made to open up Australia to trophy hunting of crocodiles. Victorian Nationals senator Bridget McKenzie promoted the idea to the ABC. "I think there is a fabulous opportunity within Australia to actually develop a trophy hunting industry," she said. But is this what we want conservation to be about?